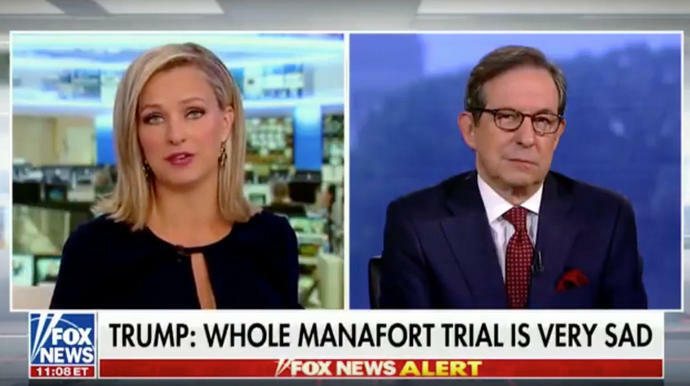 Fox News anchor Chris Wallace was asked by fellow anchor Sandra Smith on Friday what he thought about President Donald Trump's comments on the trial of former Trump campaign chairman Paul Manafort. "I think the whole Manafort trial is very sad," Trump told reporters before boarding Marine One on Friday. "I think it's a very sad day for our country. ... And I think it's very sad what they've done to Paul Manafort." "We really have changed. I'm not sure it's for the better," Wallace said in regard to presidents commenting on ongoing trials. "I remember Barack Obama weighing in on Trayvon Martin or Henry Louis Gates in Cambridge, weighing in on those, and people went nuts," he said. Wallace pointed out that Trump went so far as to say "it's sad" Manafort was prosecuted at all. Jury deliberations in Manafort's trial continued for a second day Friday, with jurors leaving for the weekend without returning a verdict. The former Trump campaign chairman faces 18 criminal counts, including tax evasion and bank fraud. Watch Wallace's full comments in the clip above.